The turkey is thawing, the pumpkin pie is cooling, and the menu is set for our family dinner. Thanksgiving is a wonderful time of year to stop and reflect on our many blessings, often taken for granted. At Wessler Engineering, we have been busy collecting nonperishable food items to provide assistance for residents in our area through Hunger Inc. This is also happening in many of our Indiana communities as evidenced by the numerous social media postings. To see so many communities pitching in to make a difference is inspirational. This brings me back to the purpose of this blog…to thank you for all you do to make us better employees, engineers, and friends. 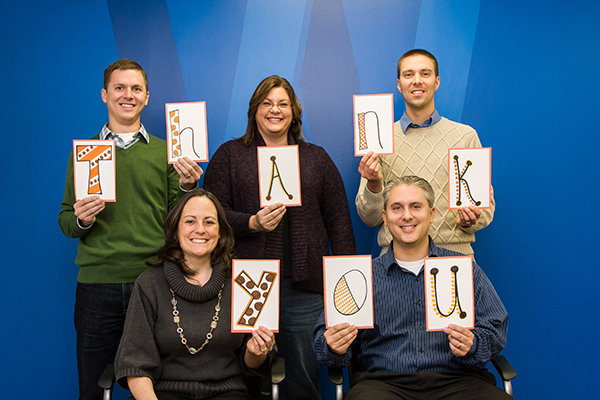 We asked our employees, “Why are you thankful for your clients?” We hope you enjoy their responses. ...for my clients because they diversify my occupation, challenge me to become a better engineer, and teach me something new every day (which is why I keep coming to work). …I am in a position that allows me to meet people who become my clients, and more importantly, friends. I am extremely thankful I had the opportunity to be friends with a client for 23 years before he passed away this year. He taught me that to make my life "work" I couldn't make work my life. The things we learned from each other – how to build a garage, clean a lagoon, welcome a son home from the Marines, install a new disinfection system, build a lift station – and especially about priorities and families, and how our company and our clients are one big family, will never be forgotten. They have helped shape my views on how our company can help make our client's life better, and in doing so, can make our lives more complete. …for my client’s many City Departments who are involved in their MS4 Program. Their enthusiasm for recycling and bettering their community is refreshing. …for clients who have and keep their sense of humor. ...my client (utilities superintendent) has no problem allowing me to attend meetings, contacting him with questions, and providing me with needed information. As an engineer intern, I continue to gain experience and confidence with each project I am presented with, and my client has shown me patience and given me his trust in producing successful projects. He is a very light-hearted guy, fun to work with, and I am very appreciative for the opportunities I have been given to work with him. ...for the open line of communication and trust that we have; this allows us to work collaboratively as a team to determine the best solutions for the community. …for clients who recognize the extra effort we often put into our projects to ensure they go well. While we sometimes have to work hard and deal with stressful issues, it’s easier to keep slogging along when you know that your client recognizes your extra effort and really appreciates it. …when a client communicates their needs by taking time to review our design. …for clients that take the time to teach me new things and are good at showing me “in the field” solutions. Engineering school is great and all, but the real education occurs through professional practice. …that our clients are decision-oriented and active participants of the design team. …for my client who is a wastewater treatment plant superintendent. We work very well together, and he is very good about communication and what he expects from the project and of me. We have become very good friends. He puts a large amount of his time and energy into his plant which also pushes me to perform at my best. ...my client pushed me like no one else! He was always on his game and expected the same from me. He worked as hard as anyone to complete the project and complete it correctly. He taught me a lot about the real inner workings of a wastewater treatment plant and a few other things along the way. …for the many ways clients provide a form of mentorship from the stand point of having a great deal of experience. …to have an opportunity to spend time with our clients who have accomplished so much and have such amazing talent; it’s inspiring. …for my clients who oversee HSE (Health, Safety and Environmental) issues at their facilities. They are very focused on workplace safety, and they strive to improve working conditions to minimize safety hazards. I’ve been able to bring safety concepts back to the Wessler Engineering office and work to apply them through our employees’ safety program. …for the true interest they have taken in my personal life when they have so many challenges professionally that demand their attention. …for our clients who coordinate and implement Wellhead Protection Plans and MS4 permit programs. Wellhead Protection planning focuses on preventing pollution to underground drinking water sources. MS4 program goals center on preventing pollution in local waterways (streams, rivers, ponds, lakes). Protecting our environment for future generations has always been a passion of mine. Working with clients who focus on these efforts is rewarding to me personally. …to have earned our clients’ trust in working on projects that will affect so many residents for years to come. ...my client is easy to work with, communicates very well, and is both a client and a friend. He has a long history in water treatment plant operations and has helped me increase my knowledge while learning from me on the construction side of things. I worked with my client on three projects and came away from them better in many ways. …for my client because he knows where to get the best pork tenderloin in Greene County. We are thankful for the many relationships we have developed with our clients (both new and old). Thank you for inspiring us. We wish you the happiest of Thanksgivings.